There’s some good news we’re discovering as the year comes to an end. YoAfrica, one of the biggest internet service providers in Zimbabwe, has slashed its home broadband internet offering to US $50 a month. And if a customer pays for a whole year (which we don’t advise by the way) the price drops further to $42 a month. The prices look “best effort” for now as Yo won’t say what the terms and conditions or what its fair usage policy is. Their new website says you have to contact them for that information. Speed wise you get 256Kbps during peak and 512Kbps off peak (nights and weekends). If you don’t understand what those figures mean, don’t worry; at that speed, you can do email, web browsing and have a decent YouTube video viewing experience (if you’re patient) but downloading huge files will be a drag unless done overnight. There’s good news as well on the setup cost. From an average $500 mid-year, now internet users can buy an indoor WiMax unit for $250. Coverage wise, the YoAfrica map says they have WiMax in Harare, Bulawayo CBD, Chitungwiza, Mutare, Gweru, Kwekwe, Masvingo and Beitbridge. Yo joins a number of internet providers that have slashed prices in 2011. ZOL, Aptics, Aquiva and Brodacom have all been slashing prices and offering low cost lite options for home use. Much of the effort has been to match PowerTel’s uncapped mobile broadband which is priced at $50 and then use the “Ours is priced the same, and it works” argument. ZOL dropped prices to $70 a month for ‘unlimited’ (for 512Kbps peak and 1mbps off peak) in June this year. Aptics has a $50 Aptics Bargain 256Kbps package. Broadcom recently slashed its i-surf package to $50 a month for 256Kbps. Africom, which offers the lowest price for very low usage users sells a 1 gigabyte bundle for $18. TelOne, the state owned sole fixed line operator, has a 30GB capped Basic ADSL plan priced at $30 a month. It sure has been a good year, and we hope the prices keep coming down in 2012. That more and more people find they can afford some kind of internet. The fair use policy on this package is ridiculous. If you download more than a GB you are placed in a throttled pool. thank you but no thank you. I wanna rock the boat / then 1 man falls / now there’s two stupid oaks! The days of dial-up internet where the hey days of YoAfrica, Mweb, Africaonline, Samara and some of those names that are no more. Now it’s wireless broadband and forget about the WiMax kind with a US$600 equipment price tag that YoAfrica and ZOL offer. It’s the wireless dongle stupid! 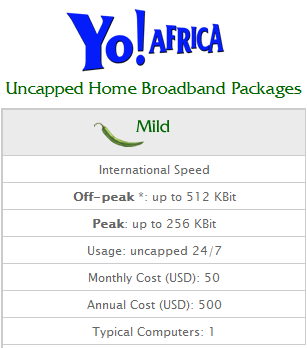 Old-style ISP such as ZOL and YoAfrica have no option but to go wireless internet with cheaply priced USB modem. Otherwise bye-bye! Ehm no, the wireless dongle isn’t the future, it isn’t even the future if WiMax. It just happens to be one of the solutions available, and it’s one and only plus is mobility. That’s all. The future is actually in wide area wireless coverage, which was the idea of WiMax in the first place. No dongle. Just your device, and you connect to the wireless network. Which could be city-wide. Sounds like things are getting much better but those setup costs are still a bit steep. Did anyone get specific info about the fair usage policy?